A few years ago my friend from college, Catie made this. She made it with Pillsbury croissant dough. As part of the one items: three ways series I am continuing with biscuits. I used them in the appetizer pizza recipe that I got from her ages ago. I did make some changes from the original that she made. 2. Open biscuits and place on greased baking sheet. Roll each biscuit out one at a time. 3. Once biscuits are all on the sheet, bake in oven at 350 for 15 minutes. 4. While the dough cooks, add together in a bowl the mayo, sour cream, Neufchatel, ranch powder, and garlic powder. 5. Mix all ingredients together until blended and mixture is smooth. Cover and refrigerate until ready to use. 6. Once dough is finished cooking, let set and cool for 10-12 minutes. 7. Clean the head of broccoli and chop into tiny pieces. 8. Once dough is cooled, take the ranch mixture and spread on the dough until completely covered. 9. 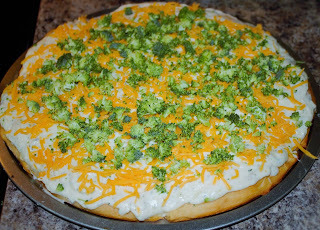 Sprinkle the broccoli piece along with cheese on top of the pizza. 10. Refrigerate for 30 minutes or until the spread has set. This would be either a snack or an appetizer for a party. Does anyone else have any appetizers that they make with biscuits? ?